Submitted by Denise Azucena on Sep. 6, 2017. Original photograph by Ralf Schulzei, modified by Jason Horton and available under Creative Commons license. Harmonicas have gained various nicknames, including blues harp, tin sandwich, pocket piano and mouth harp. Its handheld and rectangular design, along with its ability to produce a range of tones, are the reasons for why the harmonica has earned these names. Since its release during the 1800s, this instrument has been used in many genres, such as classical, folk, country, rock, jazz, and blues. This guide focuses on the best diatonic harmonicas that are great for playing blues. 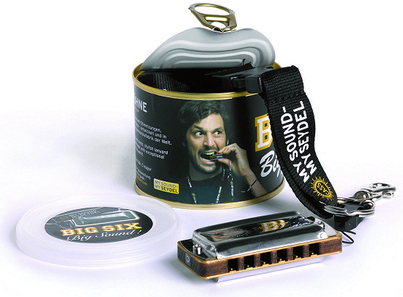 The Big Six Blues Classic is a 6 hole miniature harmonica that comes with a decorative tin can packaging, and a lanyard to wear it around your neck. At first glance it looks like a toy, but it actually produces a professional sound since it has the same stainless steel reeds modeled after the Classic Seydel 1847 harmonica. For a small harmonica, many reviewers mentioned the Big Six Blues produced a clean sound, full and as loud as a standard 10-hole harmonica. Even with just six holes, a lot of users found it easy to bend notes and were able to play a variety of songs. There were also reports of combs not swelling after long periods of time, even though it's made out of wood. On the other hand, there were some users that preferred a harmonica with wider range. Some of them, who are used to playing a 10 hole harmonica, find it a bit challenging to use and may take some time to adjust to because of its size. This is a great option if you want a small and compact harmonica that still packs a punch. The Major Diatonic harmonica features Lee Oskar’s plastic comb that’s easier to clean and maintain. Its recessed bed securely holds the reed plate in order to prevent air leakage and project louder sounds. Since Lee Oskar are one of the pioneers the modular system, they provide replaceable and easy to install mountable reed plates for this particular harmonica along with the rest of their harmonica line. This harmonica received a lot of satisfactory ratings when it comes to its quality construction and sound for its price. Its reeds are quite durable, and when worn out after a long period of use, many users were pleased with its economic factor since its replacement reeds are easy to install and cost less than the harmonica itself. In terms of playing, a number of users mentioned this harmonica produced a bright and full tone with effortless bending. Some users suggested that this harmonica is not ideal for using advance techniques such as "overblowing" since it doesn't produce much impact. With its big holes that prevent overlapping notes while playing, this harmonica is a great choice for beginners and for those who are looking for harmonica that's easy to repair. The Special 20 has been used in both public performances and recordings by music industry veterans such as Bob Dylan, and John Popper of The Blues Traveler Band. 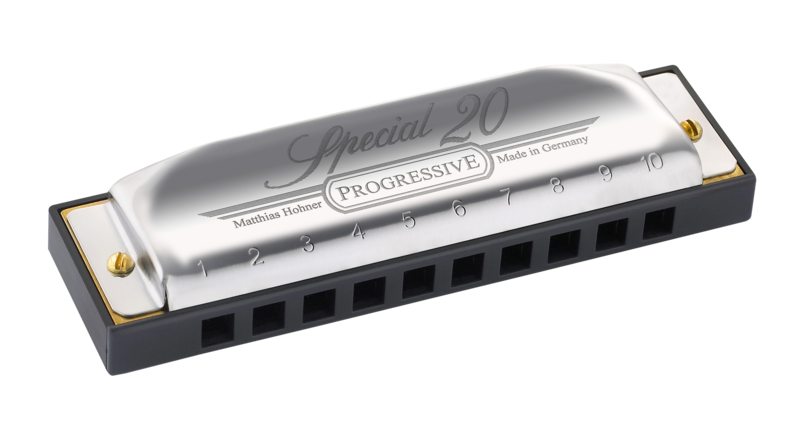 A lot of modern harmonicas were modeled after the Special 20. It showcases an airtight design and recessed reed plates for faster sound production. Its comb is made of plastic, which lasts long since it doesn't absorb any moisture, while its classic reeds and tuning provides great response and rich tone. As expected from an industry standard instrument, amateurs and professionals alike raved about how well made it is. It's sturdy plastic comb with recessed reed plates are what makes it comfortable to play as well as easy to clean and maintain. Since its plastic comb is less prone to moisture, it's less likely to wear and tear after long periods of time. Although it is reported by some beginners drawing on some of the holes were a bit challenging for them, many of them still find it easy to use when it comes to bending techniques. At a reasonable price point, this harmonica is an exceptional choice for both professional and beginners alike. 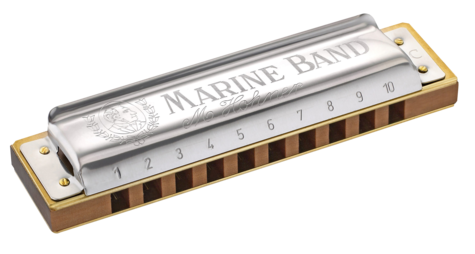 The Marine Band 1896 is one of the original blues harps designed by Hohner and has been a staple ever since. Since its patent in 1896, it has been played by world-renowned musicians, such as John Lennon, Bruce Springsteen, Neil Young. To this day it is still being used by many professional harmonica players around the world. It has a reputation for its full tone, patented stainless steel covers, and its wooden comb. Versatile and reliable for its price, the Marine Band produces a bright and rich sound suitable for playing blues, rock and country songs. Professional harmonica players have praised its quality exterior and responsive reeds. The plastic case that it comes with it provided decent information for maintenance of the harmonica. Many users mentioned the holes were smaller and its built-in wooden comb are stiffer compared to other harmonicas they have tried. In this case, beginners may find it challenging to play at first, though they get better over time with practice. Since it has a wooden comb, the downside for this is that it swells when it gets moisture and it may cause lip injury after long periods of time. It takes a bit more effort when it comes to taking it apart for cleaning and tuning, but with proper care, it's built to be durable and long lasting. Overall, this is a great choice for intermediate and professional players. 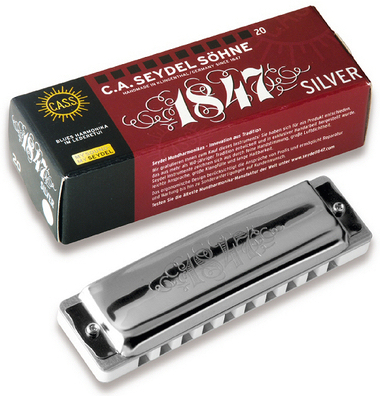 The Blues Silver 1847 is well known for its stainless steel reeds and non-corrosive silver-finish reed plates. Instead of having the Classic 1847's maple comb, the Blues Silver version has been upgraded to a solid polymer comb built with an addition of stainless steel reed plate screws. Its cover plates are built to be beard and lip-friendly due to its rounded edge design. Many owners who reviewed it praised its quality craftsmanship and durability, given that it has built-in steel reeds. Many of them mentioned it's easier to grip and play than many other models because of its ergonomic design. Its non-vented cover plates contribute to the warm sound it produces. Professional players who own multiple harmonicas tend to use this harmonica often during live performances while accompanying other instruments due to its responsiveness and loudness. This harmonica offers great value for money. The Swan 10 Hole is an basic diatonic harmonica made for beginners. It showcases a very simple silver design with a logo embedded and a stainless steel cover plate. It also comes with a plastic case with a cloth to keep your harmonica clean and safe. Although it doesn't compare to bigger branded harmonicas, it delivers a decent sound when played. At first impression, most users liked the silver finish and sleek design that's similar to high end harmonicas. They were also pleased that it comes with the instructional manual to assist new users on how they can use and take care of the harmonica. The wing-nut design also makes it easy for wide-open cleaning. There were some comments on how it's not as loud enough. Some users reported issues saying a few of the sound holes weren't consistent when it comes to blowing or drawing, which is to be expected at this price. A really good entry level harmonica for hobbyists or children. It's recommended for beginners and for blues players to start with diatonic harmonicas. They come with 10 holes and are tuned to a major or minor scale of specific key. For example, if it's tuned to the key of G, it will only play the G major scale. Although you can play blues on a chromatic harmonica, diatonic harmonicas are a befitting choice for playing blues, country and folk because of the additional drawing and bending techniques needed to produce that "bluesy" sound, and the missing notes from the scale. As mentioned above, harmonicas are tuned to a specific key. It’s best to get a harmonica tuned to the key of C if you’re just starting out. You’ll be able to play up to 3 octaves on a C major scale. Most of the songs you will learn are also tuned to the key of C. Most blues harmonicas are played in what's called a "second position" or also known as a "cross harp". This means playing the harmonica tuned to a perfect fourth below the original key of the written music by using the 2 draw hole as a root note instead of using the 4 blow hole used for the first position and original key. If the music is written in G, then a C harmonica is used in the second position. This is the most common position used for playing blues. Choosing a comb material matters more in terms of maintenance. There are four kinds of materials produced: wood, plastic (ABS), plexiglass and metal. For beginners, it's best to go with plastic since it's easy to maintain and is comfortable on the lips. Metal combs are also another option that's less prone to wear and tear due to screws, though they are a bit more expensive. Wood is also another common material produced and they are much more prone to moisture, which can cause swelling and may leave cuts in your mouth while playing the harmonica, yet some people say that they give a much "warmer" sound and don't mind the efforts of maintaining it. The cover of the harmonica is what creates the acoustics. It all depends on what type of sound you are going for when it come to choosing the type of cover design. A lot of affordable to mid-range priced harmonicas have traditional covers where the back of the cover is more open producing a bright and clear tone. Another type is the cover-all design, which slightly muffles the harmonica, but resonates it more to produce a full, warm, and mellow tone. Metal covers produce a brighter sound while plastic produces a much softer sound. The quality of the harmonica are usually is on par with the price, especially with ones that are well built with high-grade materials. If you're a hobbyist, a budget option would suffice. If you are serious about learning, it's more difficult to learn on a cheap harmonica since its poor construction causes air to leak out making them hard to play. It's best to invest in harmonicas that are within the $30 - $65 price range. Because a particular model of a blues harmonica comes in several different keys, we decided to take the approach of only rating ones in the Key of C because the ratings are similar across the different key versions of a particular blues harp. This means you can use our guide to decide on a model you like and then buy it in any key you want. Once we had established this approach we then gathered feedback and reviews about each relevant harmonica that was available from major American online music gear stores. Our rating sources included online retailers, forums, blogs and music gear review websites and videos, in fact there were over 5,200 sources that we used for the Gearank Algorithm to produce scores out of 100 for each harmonica. We then used those results to select the highest rated options, along with a good budget option, to recommend above. We also used those review sources to report on what musicians say about each model we recommended. You can see all 25 models that were short-listed in the Music Gear Database. For more information about this process see How Gearank Works. Submitted by Patrick Clark (not verified) on May. 4, 2018. Seydel 1847 classic are my favorite. I have a few Suzuki Manji, and several Hohners like marine band deluxe, special 20,and rocket. 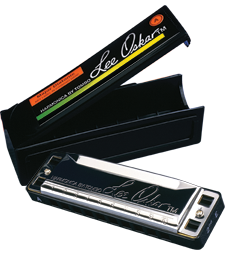 I've heard that Lee Oscar's are not a good harmonica especially for bending if you're a beginner. If I had to recommend a good, decent priced harmonica for someone starting out I'd recommend a Hohner marine band or special 20. The marine band has a wood comb and the sp20 has a plastic one. Once you progress or can afford to spend a few more dollars on a good quality harmonica I'd say a Seydel 1847 classic, or Hohner crossover. Submitted by Anonymous (not verified) on Feb. 8, 2019. I've tried all the major brands in the past year, having gotten serious about getting better in early 2018. I now own 57 harps, and I like the 3 Lee Oskar minor key and 2 major key harps I have pretty well. I feel the same about several Hohner Special 20s I'm pretty happy with. I don't like the feel of the Marine Band on my tongue when tongue blocking. My favorite Hohner is the Crossover; it has a smoother lacquered wood comb, costs $30 more, and has a bluesier sound that's worth it to me. I love the feel and sound of several of my even more expensive Seydel 1847 Blues Silver (white comb--$90) and 1847 Blues Noble (black comb--$110) harps, except for an A harp that has balky reeds in holes 2 and 3. I've had this issue with almost every A harp I've bought, except a Lee Oscar I recently bought. I've been disappointed with several Seydel Session Steels, which have an orange comb, feels nice and smooth, but often has balky reeds in holes 2 and 3 that are harder to get a decent sound from even for my F and G harps. I love my Suzuki chromatic 48, and have been fairly happy with my Suzuki Low D, Low F, and tremolos (C and Am). I haven't tried regular key diatonic Suzukis due to reading some negative reviews about their playability--that's hearsay though, so I can't be critical without firsthand experience with them. I should get one or two and try them, I guess.